Fiix is an online system for maintaining and managing assets and helping you perform preventative and scheduled maintenance of equipment and assets, work orders, parts inventory, reporting, purchasing, and more. The solution can be utilized to manage multiple businesses, facilities, divisions, and locations from a centralized database, through the web app or native mobile apps for iOS and Android devices. With Fiix, you can create, manage, and assign an unlimited number of work orders, and get notifications when an assignment is completed. Plus, you can attach files, videos, and images to work orders and include detailed work instructions. Technicians can track the parts used, time spent, and supplies consumed. Multiple assets can be added to work orders, and tasks can be cloned, enabling the creation of inspection rounds. Work orders for preventive and scheduled maintenance can be generated automatically generated based on a range of trigger criteria including time, date, alarms, meter readings, or other events. The drag-and-drop calendar allows you to balance workloads and priorities, assign jobs to technicians, and view the status of each maintenance job. The relentlessly attention on where and how maintenance and operations work together provides a deep and unique set of capabilities to optimize the planning, scheduling, and execution of preventative and predictive maintenance. As an early innovator, the market-leading cloud solution is modern, scalable and high performance. 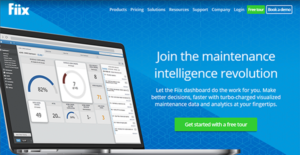 Fiix provides a freedom to focus for maintenance–not managing IT, Fiix across the board, Fiix is easy to use, implement, manage and extend. Maintenance teams are in the driver’s seat with a firm of understanding of key metrics for both operations and business objectives. Fiix partners closely with customers to guide them through a digital transformation journey, helping to ensure technicians and management alike are adopting and growing the solution. Fiix includes tools for tracking rotating spares and assets between work orders, facilities, sites, and external repair shops. You can manage permissions so that employees submit requests before moving assets between locations. Plus, there is control over who approves or rejects requests for individual sites. MRO (maintenance, repair, and operating supplies) inventory and purchasing can also be managed with Fiix, with a built-in MRO marketplace, and the ability to create and electronically send RFQs and purchase orders. Preventive and scheduled maintenance can be triggered by specific dates and times, alarms, events, meter readings, or other conditions. Notifications are automatically sent by email for maintenance requests, to send work orders to technicians, equipment alarm states, low stock, and more. Barcodes and QR codes are generated automatically for assets, allowing you to scan printed tags with the mobile app to pull up asset records. Rotating spares and assets can be tracked while moving between sites, suppliers, and contractors. Plus, management of tool inventory and usage is centralized. The CMMS workflow can be configured to match existing maintenance workflows, and drop-down menus and custom fields can be added to work order forms. Fiix is a cloud-based maintenance and asset management software solution that schedules, organizes, and tracks your maintenance activities. Fiix is cloud-based, mobile-enabled, and easy to use. It gives your company freedom from antiquated, complex CMMS software. It takes just minutes to get set up, not weeks. This cloud-based CMMS system allows you to speed up organizing all maintenance tasks and activities into one simple platform. Fiix is a simple app for your entire team. For complicated work, this system has the features you need to move projects forward. Fiix stops you from spending hours logging work orders and staring at a list of tasks trying to figure out what’s next. It’s your maintenance slog and the program is meant to end it. Get insights from your CMMS data. Create custom reports, leverage over 100 existing reports, or check key KPIs on your CMMS dashboard. The new Fiix mobile CMMS app lets you be truly mobile with your maintenance operations. New features like offline mode and easier work order management put everything you need at your fingertips—wherever work takes you. The Fiix dashboard quickly goes through the data for you, giving you immediate information access so you know what areas to improve. Whether it’s understanding low stock levels, work orders that are overdue, work requests and others, the system is able to address these. Easily import your existing assets and maintenance data from CSV or Excel to seamlessly migrate from other maintenance and asset management software systems. Easily create, assign, and manage unlimited work orders from your mobile device, tablet, or desktop computer. See who’s working on what, and get notifications when the work is complete. View, assign, and balance technicians’ assignments and priorities with the drag and drop calendar. The calendar gives you a full overview of what maintenance is done by who, when, and what its status is. Create preventive and scheduled maintenance work orders and automatically generate those work orders based on date, time, event, alarms, or meter readings. Get better control over inventory. Track parts and supplies, optimize inventory levels, or manage inventory at multiple locations through a single, integrated maintenance and asset management system. What Problems Will Fiix Solve? 1. Field-based maintenance has been a daunting task. For Vasco Vieira, Maintenance Engineering Director at Voltalia, the challenge his team was facing was obvious. They were using Excel spreadsheets to track their maintenance activities and lacked a solution to deal with document management, tickets, materials, failures, and quality controls. Further, they were unable to identify and measure any KPIs. This was made more challenging with mobile operations. Migrating to Fiix Mobile CMMS., day-to-day operations at Voltalia have improved dramatically where organization and data collection are concerned. From a technical point of view, it is easy for technicians to report and organize their time—all the info is in one place. Voltalia can now analyze activities and have indicators of effectiveness of work, and analyze the real time they take to do the work. 2. Multi-sites manage their own works impervious of the others. At Ardagh, maintenance looked like 7 different companies, each site with their own approach. There was no uniformity of work practices. Everyone was just doing their own thing the best way they could. One of the first noticeable benefits of implementing Fiix was the ability to generate detailed reports for Ardagh’s KPIs. The foundation of their maintenance program is PMs, so the first things they dove into were schedule compliance, PM task completion, and reactive maintenance percentage. 3. The challenge of getting tech-averse people to see how systems improve return on investment. After purchasing Fiix, Rambler Metals got to work learning the system. They made extensive use of the customer success services and got everyone on board quickly. Even the technology-averse guys who have trouble, say, using an ATM, could understand how to work the system. Immediate hopes for Fiix came to fruition quickly. The technicians were able to go back to turning wrenches much faster. Before adopting Fiix, there were only 8.5–9 hours of possible wrench time per shift, with the remaining time being set aside to document, sort, and prioritize asset notes and work orders by hand. Now, there are closer to 10 hours of wrench time per shift. Every enterprise has its own characteristics, and can call for a particular type of Maintenance Management Software - CMMS solution that will be adjusted to their business size, type of clients and staff and even individual industry they deal with. You should not count on locating an ideal solution that is going to work for each company no matter what their history is. It may be a good idea to read a few Fiix reviews first and even then you should pay attention to what the software is intended to do for your business and your workers. Do you need a simple and straightforward service with just essential features? Will you really use the advanced tools needed by pros and large enterprises? Are there any specific features that are especially beneficial for the industry you work in? If you ask yourself these questions it is going to be much easier to find a solid software that will match your budget. How Much Does Fiix Cost? We realize that when you make a decision to buy Maintenance Management Software - CMMS it’s important not only to see how experts evaluate it in their reviews, but also to find out if the real people and companies that buy it are actually satisfied with the product. That’s why we’ve created our behavior-based Customer Satisfaction Algorithm™ that gathers customer reviews, comments and Fiix reviews across a wide range of social media sites. The data is then presented in an easy to digest form showing how many people had positive and negative experience with Fiix. With that information at hand you should be equipped to make an informed buying decision that you won’t regret. What are Fiix pricing details? What integrations are available for Fiix? An open API, and a full set of developer resources, including API documentation, samples, sandbox, and support, allows for seamless integration to multiple enterprise systems. Integrations include ERP vendors, such as: Oracle Netsuite, Single-Sign-On, meter-readings, or Scada systems to name a few. If you need more information about Fiix or you simply have a question let us know what you need and we’ll forward your request directly to the vendor.